Friday, March 31st, 2017 at 11:00am. When Engel & Völkers Real Estate CEO Anthony Hitt had his first experience with 360-degree 3D virtual reality technology, he knew his firm had to have it. Fast. The European-based premium real estate brand Engel & Völkers has announced a second location in the upper Roaring Fork Valley. These few tips can help you be more informed about the investments you make on your listings. Closing prices in the top 10 deals ranged from $820k to $2.3M. Thursday, March 30th, 2017 at 12:00pm. For many, a second home is where responsibility and stress of the daily grind simply don’t exist. A second home is a realization of your passions, whether it be skiing, beach living, golfing, hiking or simply enjoying the view. It’s a place to make memories and relax with friends and family, so it’s important that it remains a sacred retreat that you continue to dream about and enjoy. Décor and design scheme are important elements of a home’s personality, so here are a few things to consider when decorating your home-away-from-home. Monday, March 27th, 2017 at 6:05pm. According to a survey by the American Cleaning Institute 72 percent of Americans engage in the ritual of spring cleaning every year. From small apartments to large homes, the ritual is different for everyone. The one thing that should hold true for all is to have a plan. Here’s a list to consider and to start with if this is your first Spring Cleaning effort. Engel & Völkers North America has launched a network-wide initiative to integrate virtual reality technology, capabilities and support into each of its real estate shops. Anthony Hitt, CEO of international real estate agency Engel & Völkers discusses how millennials are transforming the housing market and how realtors do business. New U.S. single-family home sales jumped to a seven-month high in February. With a record-setting year behind us, what does the future hold? Friday, March 24th, 2017 at 10:27am. What better way to spend a Saturday afternoon than a leisurely skate for a good cause? On March 18, Engel & Völkers Ottawa did just that, inviting friends and clients to take the ice at Tom Brown Arena in support of our partner, Special Olympics Ottawa. Advisors Luke McMurdo & Joseph Rogers along with License Partner Larry Mohr out on the ice. Several community members joined us for the event, including young families who were able to take advantage of the ice time and free hot chocolate. Many real estate professionals have graduated from the “school of hard knocks” or some form of on the job training, with a trail of successes and failures and a string of transient mentors along the way months or even years after they have obtained their real estate license. Friday, March 17th, 2017 at 8:58am. Real estate firm Engel & Völkers North America will be the latest to tap virtual reality for homebuyers to view listings. Engel & Völkers North America has announced its 2016 award winners, with Engel & Völkers Minneapolis given the company’s highest honor. Developer says he's selling because he's not in the event venue biz. Investing is less risky, growth is easier to predict and appraisals are less tricky. Wednesday, March 15th, 2017 at 10:00am. How is it that the hot always seem to get hotter? As the largest island in the Balearic archipelago off the coast of Spain and a popular travel destination year-round, Mallorca has long been a hot spot, especially for visitors from northern Europe. Even more, according to Engel & Völkers’ most recent report on the island, international buyers are increasingly investing in premium properties across Mallorca as they’re consistently attracted to the land’s mild climate, accessible flight connections and cosmopolitan atmosphere. Wednesday, March 15th, 2017 at 9:17am. Engel & Völkers North America, today announced the recipients of the company’s 2016 North America awards. Engel & Völkers Minneapolis was awarded the company’s highest honor, The Engel & Völkers Cup, which is given each year to the shop that successfully demonstrates market leadership through the successful use of the brand’s systems, tools, and marketing programs. “Engel & Völkers has established a solid reputation of premium international real estate service because we continue to attract top performers who share our commitment to quality and professionalism,” said Anthony Hitt, CEO of Engel & Völkers North America. Sunday, March 12th, 2017 at 11:07am. 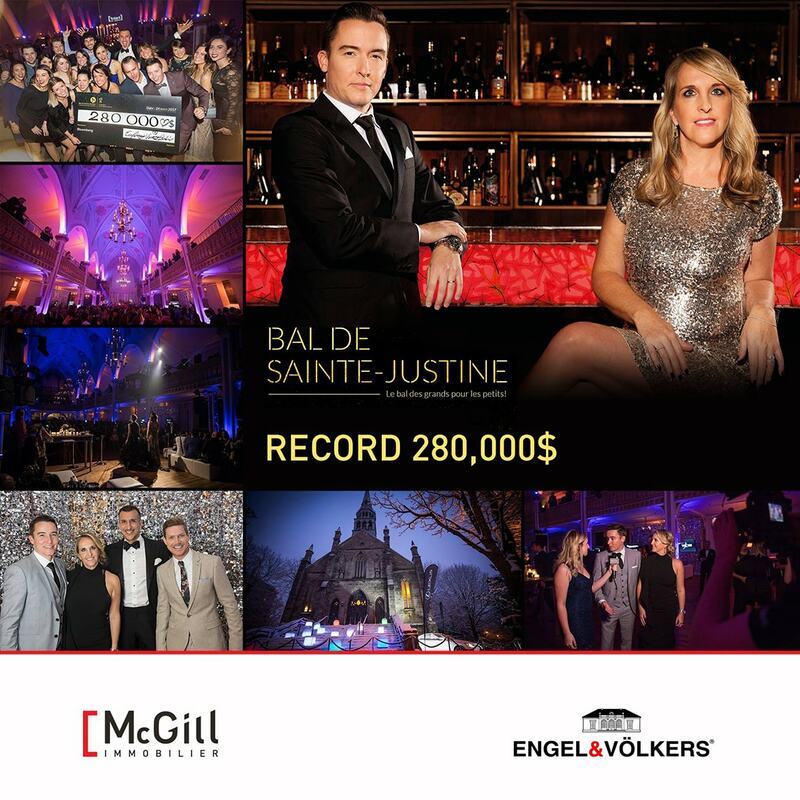 L’édition 2017 du Bal de Sainte-Justine édition 2017, a eu lieu le 24 mars, 2017 grâce à plusieurs ambassadeurs incluant Patrice Groleau et Debby Doktorczyk ainsi que Engel & Völkers Montréal / Québec en tant que commanditaire principale de la soirée. Le bal qui a lieu au profit de la Fondation CHU est un des évènements reconnus à Montréal qui est toujours parfaitement exécuté et organisé par des bénévoles du Cercles des jeunes leaders. Le but de la soirée était d’amasser 250,000$ (net) au profit de la Fondation CHU Sainte-Justine. Le bal a amassé un record de 280,000$ (net).